My oldest Lucas starts school on the 17th August, yes not long. Not sure why we have different school holidays up here but we do. I wish he wasn’t starting until September like the English school, keep him my little baby for longer. Along with buying uniform’s etc, there is the packed lunches I have been stressing about. So when I was asked to review Hit Spring Water, I said yes please. The bottles come in handy child size, fits perfectly into a lunch box. Yes I have tried, along with the sandwiches I’ve made up, the piece of fruit and small treat. They have secure lids, with the little plastic tops which come off and then the sports style opening. Perfect for opening and closing, reducing spillages and embarrassment at school. Lucas loved the bottles, they are perfect for pre-school and early school age children as they have characters they can identify with. 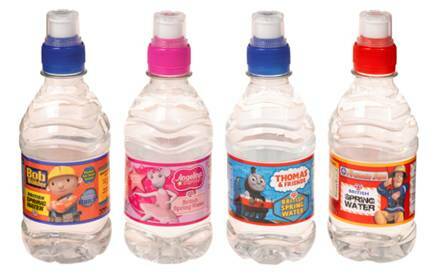 Hit Spring Water come with Angelina, Fireman Sam, Bob the Builder and Thomas. They are cute and colourful, any little one will love to drink out of these. I highly recommend these bottles of water, they are the perfect size and look great for children. I know I will be buying a few of these when he first starts to go for packed lunches. I don’t think I will buy them for everyday as it may work out a little expensive. But at 49p each or £2.49 for 6 it’s not too bad. For the peace of mind that we won’t end up with soggy sandwiches. What do you think? Disclaimer:- I was sent 3 Hit Spring Water Bottles to review in exchange for an honest review I have given above.